Afrinagan is a blessing ceremony for the congregation or a memorial service for the departed members of the community. 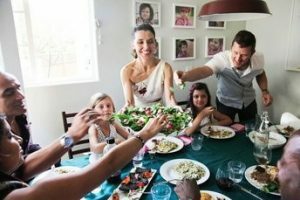 Afrinagan ceremony is also known as the flower ritual because flowers play an important role in this ceremony. Afrinagan is also the name of a vessel for holding the sacred fire. Bahman is also the name of the second month of winter in the Zoroastrian calendar. Some Zoroastrians believe that Bahman is the protector of animals. 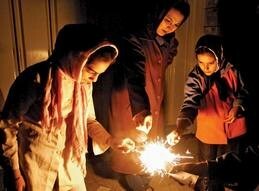 Chahar Shanbe Suri is celebrated every year on the eve of the last Wednesday of the year. On this day, people set up bonfires at their homes or parks and jump over them to be healthy and happy. Another ritual is to cover oneself in a white sheet to look like a ghost and go door to door banging on the pots and pans asking for money and treats (much like the Halloween). 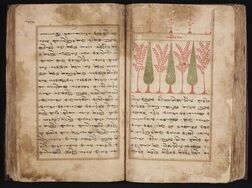 The Denkard is a Zoroastrian medieval text written in the 10th century CE. It contains many different myths and stories about Zarathushtra’s life and birth. The Denkard had nine volumes originally, but the first and the second volumes have been lost. The Denkard is an important book because it gives us a lot of information about Zarathushtra’s life. Ervad or Herbad is a title for Zoroastrian priests. Another name for a Zoroastrian priest is mobed. A Mobed teaches the Zoroastrian beliefs. Mobeds usually perform prayer services in a fire temple in front of a sacred fire. 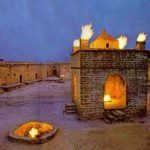 A fire temple is a Zoroastrian place of worship. 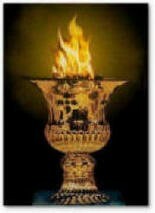 Fire is important for Zoroastrians because it is God’s seventh creation, and it is the symbol of light. 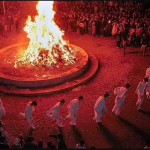 Zoroastrians honor fire but they never worship it. Farvahar is a symbol of Zoroastrianism and its history goes back to ancient Egypt and Persia. Farvahar represents good thoughts, good words and good deeds. 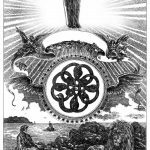 The symbol shows a man holding a disc in his hand and having two wings. The man is the symbol of wisdom, while the wings represent good and evil. Today Farvahar represents Iranian nationalism and identity. Many non-Zoroastrians use the Farvahar to show their love of Iranian ancient history and culture. 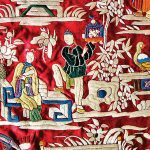 Gahambars are seasonal festivals celebrated in honor of God’s six creations: Sky, Waters, Earth, Plants, Cattle and People. There are six different Gahambars in a year. 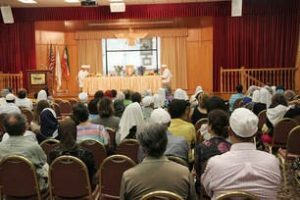 Gahambars are good occasion for Zoroastrians to get together for prayers and feasting. 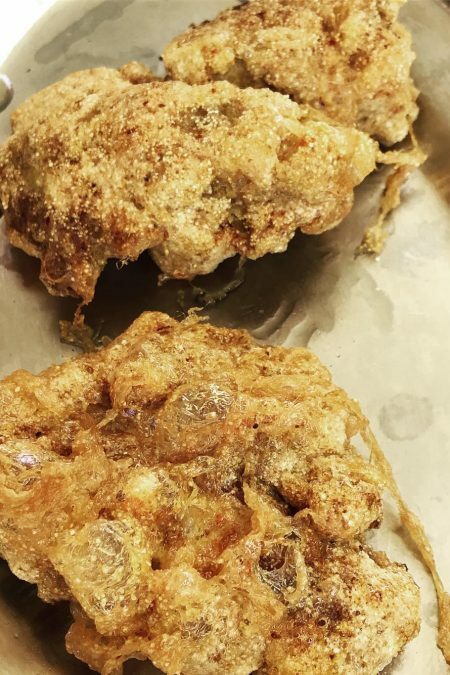 Gahambars are usually celebrated for five days. Haurvatat (Khordad) means perfection and it is one of God’s six aspects. Haurvatat is always accompanied by Amartat (immortality), and they are both members of the Amesha Spentas. The Gathas tell us that we should try our best to gain perfection and immortality by being truthful. It also tell us that the truthful people will be rewarded with perfection and immortality. 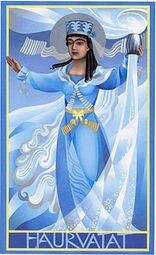 Traditional Zoroastrians consider Haurvatat as the guardian angel of waters. Haurvatat (Khordad) is the third month of spring and it starts on May 22nd. 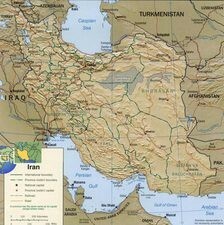 Iran is an ancient country in the Middle East. Although majority of Iranians today are Muslims, Iran has a rich pre-Islamic history which goes back to 7000 BCE. Zoroastrianism started in Central Asia among the Iranian tribes more than 3500 years ago, but it eventually became a dominant religion in the Iranian plateau. ​From Iran, Zoroastrianism spread to Mesopotamia and Asia Minor. Zoroastrianism has influenced Judaism, Christianity, and Islam. Ideas such as belief in one God, the afterlife and good and evil have all originated from Zoroastrianism. 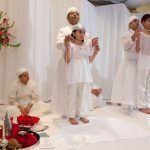 Jashan is a Zoroastrian thanksgiving ceremony. 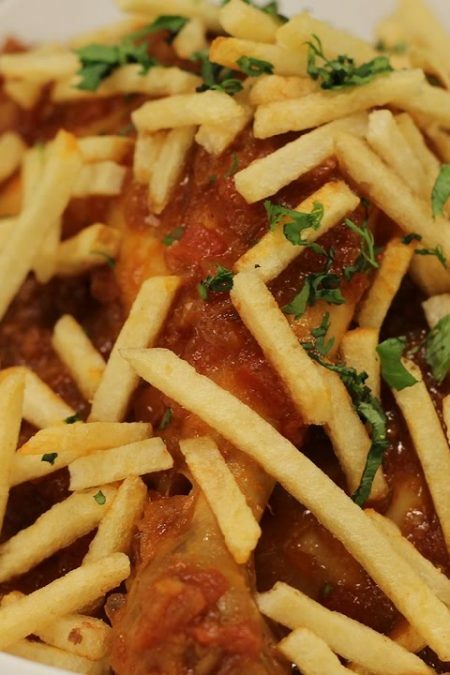 It is conducted to celebrate the birth of a child, a graduation, an engagement or some other happy occasion. The ceremony can take place in a temple or at home. A Jashan is usually led by one or more mobeds. Jashan is usually performed around a white tablecloth set with various items such as flowers, fruits, milk, water, fire or a divo (oil lamp) among other things. The ceremony starts with a prayer service and ends with a reception accompanied by food and music. 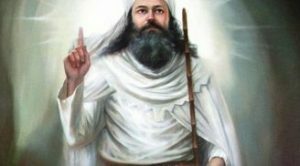 Devout Zoroastrians always wear a white shirt known as Sadreh under their clothing, and they tie a sacred cord around their waist. This cord is known as Koshti. The Sadreh is the symbol of purity and Koshti symbolizes the commitment to service and truth. A Koshti has 72 strands which symbolizes the 72 chapters of Yasna (a section of the Avesta). Before bedtime, some traditional Zoroastrians burn a small fire with incense, sandalwood or frankincense. They take this fire and walk around their homes fumigating the entire home while reciting prayers. This ceremony is called Loban. 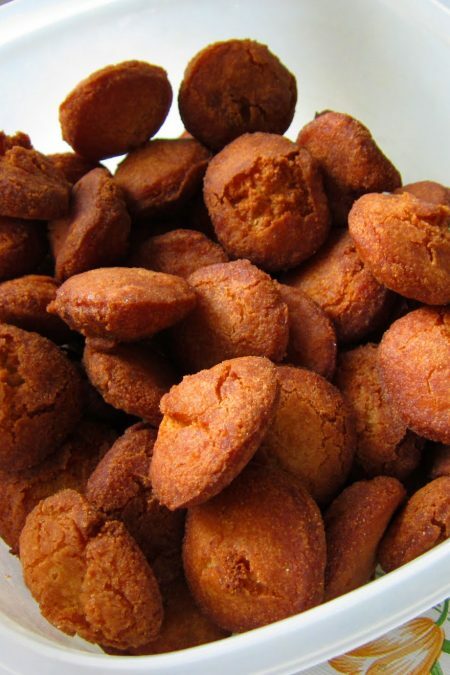 It is said that Loban helps with sleeping and disinfect the house at the same time. According to the Zoroastrian creation story Ahura Mazda created the First Man named Gayomard (Kiyomars). The First Man was attacked by the Evil Spirit, Ahriman and was killed. 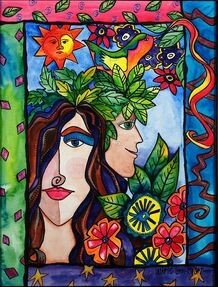 From his dead body grew a rhubarb plant and from this rhubarb plant came out a man called Mashya and a woman Mashyana who were connected together. They were exactly the same and equal. According to this myth, Mashya and Mahyana promised God to follow good thoughts, good words and good deeds, so God gave them body and soul. After that, they went on to have 15 twins who scattered all around the world and made various races. 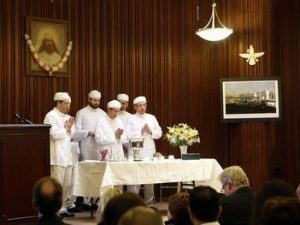 Zoroastrians do not believe in fasting. However, they avoid eating meat 4 days a month. These 4 days are called Nabor which means “don’t cut.” In the Zoroastrian calendar each day of the month has a name. Nabor always falls on Gush, Ram, Mah and Vohuman, which coincides with 2nd, 12th, 14th and 21st day of the Zoroastrian month. 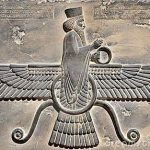 ​Ohrmazd is another name for Ahura Mazda the Zoroastrian God. 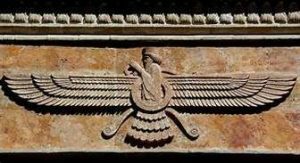 Zoroastrians believe in one God who is the Creator of the world. They believe that people have been created to help Ohrmazd make the world a better place to live. That’s why destroying poverty, protecting the Earth, and fighting injustice is very important for Zoroastrians. Ohrmazd (Ahura Mazda) has created the freedom for people to worship and live their lives as best as they can. That’s why Ohrmazd does not get angry, take revenge or hate. God is kind, peaceful and generous to everyone. 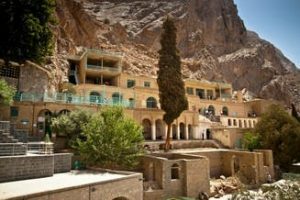 Pir-e Sabz is the most sacred Zoroastrian shrine. 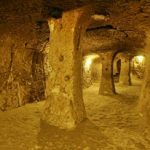 It is located beneath a cliff near the desert city of Yazd. The legend says that a daughter of Yazdigird III, the last Zoroastrian King of Iran, fled to these mountains and took refuge there from invading Muslim army. Zoroastrians visit this shrine every year on June 14th to 18th. Qissa-I Sanjan in Persian means the Story of Sanjan. This story was written by Bahman Keikobad in the 17th century. 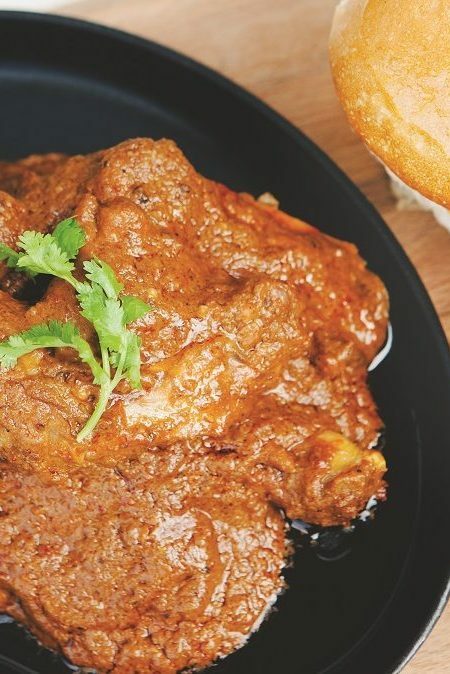 The Story of Sanjan tells the story of those Zoroastrians who migrated to India in the tenth century to escape Muslim persecution. 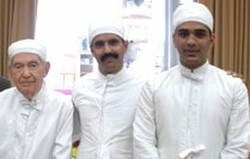 These Zoroastrians are known today as the Parsis. 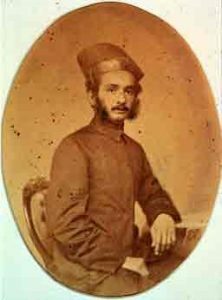 Many Parsis became successful businessmen and contributed greatly to the development of India. They built factories, hospitals, schools and many orphanages. The Rivayat are a collection of letters in Persian sent from Iran to the Parsis of India. These letters were composed between 15th to 18th centuries. The letters consist of answers from Iranian mobeds to Parsi mobeds’ various religious questions. Soshyant is someone who is a benefactor. Zarathushtra calls himself a Soshyant. 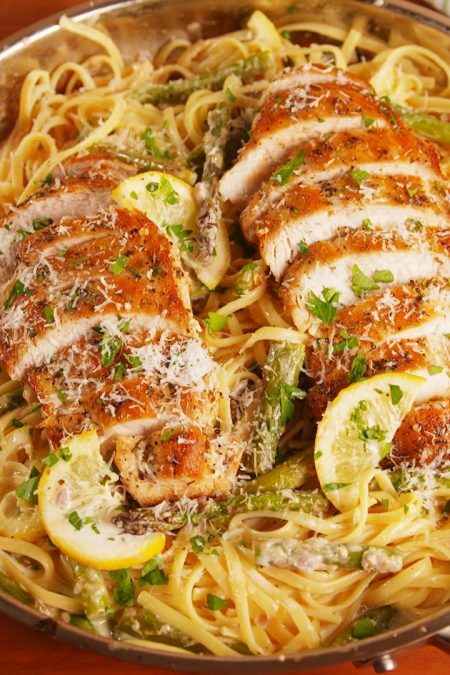 Anybody who makes the world a better place to live is a Soshyant. 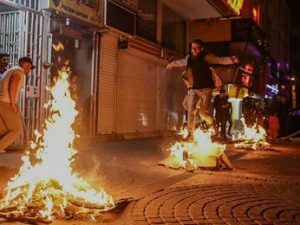 Later tradition, however, says a Soshyant is a future savior who will appear at the end of the world to save the people from injustice. 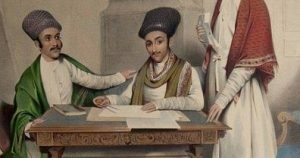 Traditional Zoroastrians believe in three different Soshyants who will appear in future. Zoroastrians traditionally divide a day to five different periods or gahs and pray at each gah. The gah (period) between midnight to dawn is called Ushahin. Devout Zoroastrians clean themselves. Then they stand toward the sun or a light and pray. Vishtaspa was a powerful king who helped and supported Zarathushtra. After King Vishtaspa converted to the Zoroastrian religion, his minister Jamaspa and his wife Queen Atoosa followed. King Vishtaspa’s conversion to the Zoroastrian religion helped Zarathushtra spread his Message. The tradition says that Jamaspa later married Zarathustra’s youngest daughter, Pourchista. 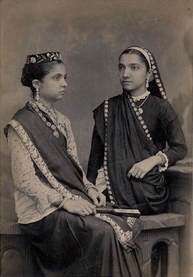 Wadias are a successful Parsi family originated from Surat, a city in Western India. Wadia means shipbuilder. In the 18th century, the Wadias started a company making ships and later buildings, bridges and dams. ​One member of the Wadia family was Ness Wadia who established the first wireless company which connected India and Britain for the first time. In 1919 he became the first Indian to be awarded the Knighthood of the British Empire. Today Wadia family members contribute greatly to India’s culture and economy. 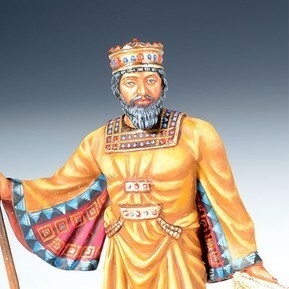 Xerxes was a Zoroastrian king who lived in the fifth century BCE. 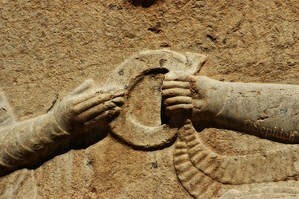 Xerxes’s grandfather was Cyrus the Great. Cyrus conquered many places and freed the Jews from captivity in Babylon. 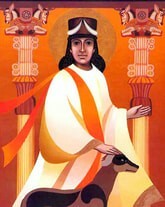 Cyrus respected the conquered people’s religions, customs and language. His human rights charter is knowns today as Cyrus Cylinder and it’s the oldest declaration of human rights in history. Yazatas are the divine beings worthy of worship. 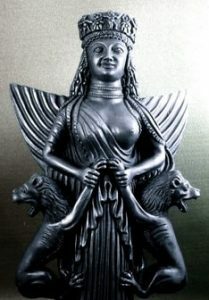 Traditional Zoroastrians consider them as guardian angels while other Zoroastrians see them as God’s different aspects. The Gathas do not mention the Yazatas by name, but today some Zoroastrians pray to them for help. 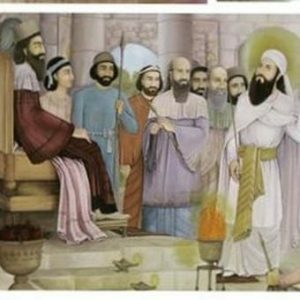 Zarathushtra Spitaman is the founder of the religion of Zoroastrianism (Din e Behi). The ancient Greeks knew him as Zoroaster. In Iran today, people lovingly call him Ashu Zartosht (the righteous Zartosht). Zarathushtra was the first monotheist. This means he was the first person who believed in one God. He was also the first environmentalist because he asked his followers to protect the environment. 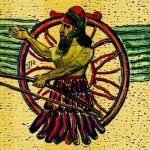 The above Alphabetical representation is compiled by Rebecca Cann and we thank her for giving us the permission to publish it here, in the larger interest of the Zoroastrian Community. We hope our children will benefit from this wonderful pictorial compilation. G00d & Knowledgeable. Very helpful to guide our young generation. A few words should be made easier for the young generation to understand and take interest.Otherwise a good concept. Nice idea. More required to generate interest. Excellent. For the younger generation this could be the beginning of their journey. Am sure they would be motivated to go into the debth of our religion.